Lecture " Comfort cities. Step 1: renovation of the lost public spaces"
Why is it so important for city and citizens to take back the lost public spaces? Where do the healing of neglected space begins? How is the state of the public space affects to its perseption? Answers for this questions will be given on examples of the renovation of Square #3 on the Contractova Sq. and the renovation of Zamkova Hora in Kyiv. 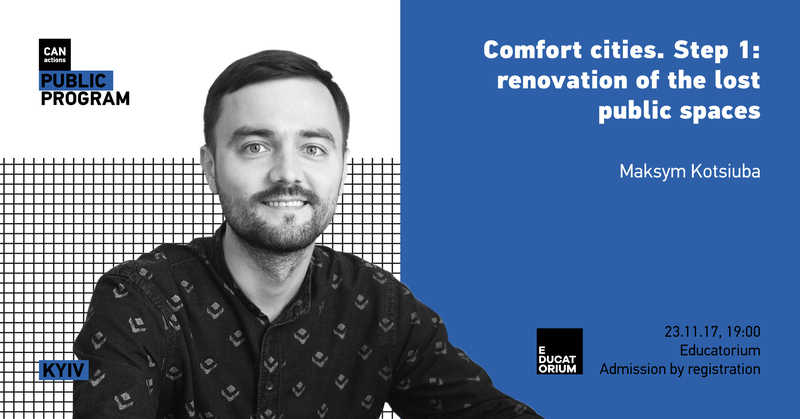 The lecturer will be the author of this projects, landscape architect and founder of studio Maksym Kotsiuba. Lecture "The latest projects of Zotov & Co"
Lecture "Burning man – festival of transformation?" Lecture "Five words about the transport problem of Kiev"
Lecture "Digital: thrive in an age of disruption"